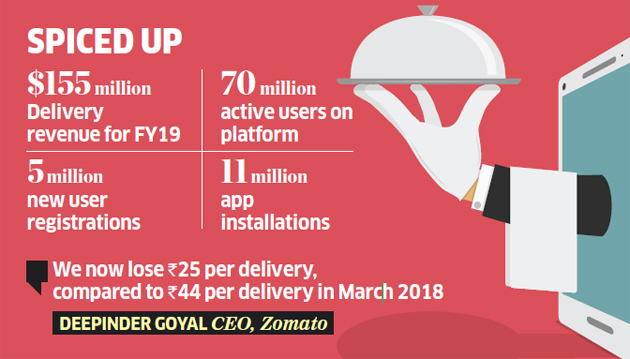 Food delivery and restaurant discovery company Zomato has recorded $206 million (about Rs 1,339 crore) in revenue for FY19, a three-fold jump in topline on-year, driven primarily by its core food delivery business. 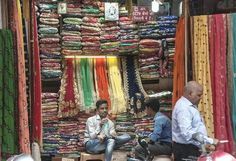 In its annual report for 2018-19, the Gurgaon-based company said its revenue run rate was at $350 million. A run rate is a projection for the year keeping in mind the highest monthly revenue number. The Ant Financial, Sequoia Capital and Info Edge-backed company said costs had risen by more than six-fold to $500 million in the just-ended financial year, compared to $80 million in FY18. Monthly burn is estimated at $24.5 million, according to calculations by ETbased on the overall burn figure of $294 million. While the annual report did not provide a breakup of losses for the year, it said a significant portion was due to its food delivery business, supported by increased promotional marketing spends and costs associated with its aggressive first-to-market strategy. The company said all financials in the report were based on management information systems and unaudited. It said the annual report followed the Indian Accounting Standard, which was applicable in FY18, which means discount-driven promotional cost borne by the company has not been deducted from the revenue. Zomato, which has a presence in an estimated 10,000 cities across the globe with over 1.4 million active restaurants on its platform, claims to be market leader in search and discovery in 19 of the 24 countries it is present in. The annual report also said it has 70 million active users on its platform, allied with 5 million new user registrations and 11 million app installations. The Deepinder Goyal-led company saw delivery revenue for the year at $155 million, up more than 300% compared to $38 million it recorded in FY18, a development which also signals the increasing spending power of the Indian urban consumer, along with greater acceptance of the service. 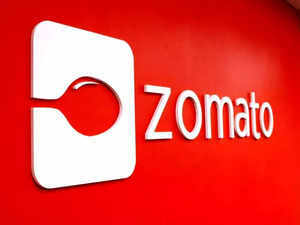 As per numbers released by Zomato, its food delivery service contributes about three-fourth to overall revenue. Unit economics, as per the company, also improved. “We now lose Rs 25 per delivery, compared to Rs 44 per delivery in March 2018. Our last mile cost per delivery is now Rs 65, compared to Rs 86 in March 2018. The key driver metric of unit economics — number of deliveries per rider per hour — has gone up to 1.4 from 0.9 last year,” said Goyal, chief executive, Zomato, in the report. The dining out vertical recorded 63% jump in revenue, coming in at $49 million in 2018-19. Separately, the sustainability business, which includes the recently-launched food supply chain Hyperpure, recorded revenue of $2 million.